Day 2 of shows at Vancouver Fashion Week (VFW) has now come and gone. As I have said before - the fashion bar has been seriously raised, so it was fun to watch everyone come in. Miranda Sam and Aurora Chan from Style by Fire particularly caught my eye as they were sporting looks from Dawson & Devereaux that were shown on the runway yesterday. Kudos ladies! If you haven't checked out their website - you should. They have been taking an amazing number of images both of the runway and the audience that will be going up over the next few days..
As I was wearing black, studded sunglasses courtesy of The Optical Boutique and steampunk "eyewear-themed" jewellery by Carolyn Bruce on Monday, I decided to mix it up today with something more demur. 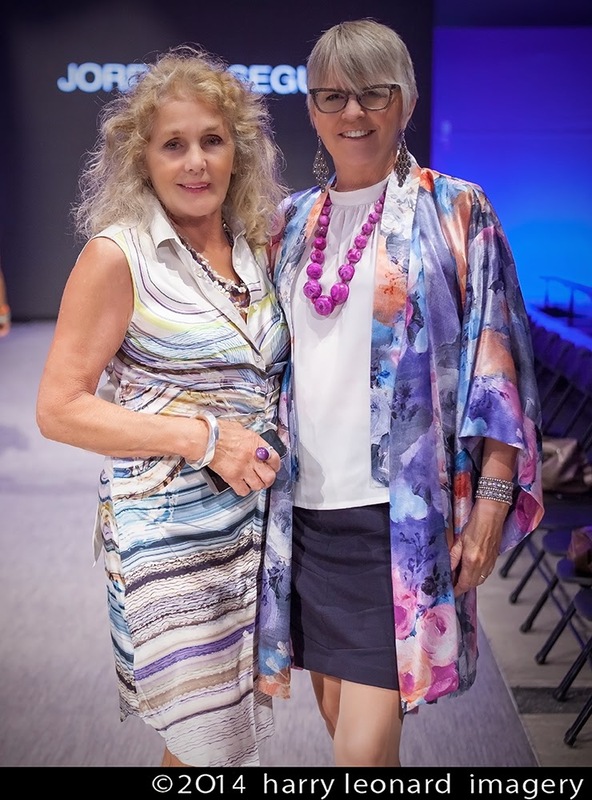 Out came a beautiful, mid-length silk kimono by one of Vancouver's top lingerie designers - Patricia Fieldwalker - paired with a white blouse by RozeMerie Cuevas of JAC and a navy skirt. Originally I was going to use a statement necklace in variegated blue fibres hand made for me by my talented daughter, but it just didn't lay right with the kimono. I was saved when Suzana Engelbrecht came up to me with a beautiful fuchsia necklace she had made as a gift. I was so touched, surprised, and shocked. The necklace arrived in the nick of time and just happened to match my outfit. Another great moment yesterday happened at the very end of the evening. I had been trying to connect with designer Akira Kuwabara for the last 24 hours - ever since I saw his show. There was a green jacket in his collection that screamed my name. I couldn't get it out of my head. Two of the lovely volunteers managed to find him, bring him to me and explain what I wanted. Akira went back to his hotel, brought the jacket back at the end of the night to try on and it fit me like a glove. He left to return home this morning, but allowed me to keep the garment to wear on Saturday. After that I have to return it or figure out the finances to keep it. Working on it as it's a meant to be in my closet as far as I am concerned. Now for the shows this day. LaSalle College is being covered in a separate post, so here are 3 I picked and 1 actually chosen by a photographer in the pit. I thought it was great to include a show from their perspective. As always - remember, there were a lot of great designers this day. This is just a small representation. One of the shows that caught my eye even before it hit the runway was that of Iman Nakhala. Why? Because Samantha Sito of Obsessive Trend Invitation was wearing a beautiful full length gown created by this designer. WOW! Here is an excerpt from her VFW bio - Traditional. Avant-guarde. Meticulous. Spontaneous. Organized. Adventurous...Iman Nakhala embodies a cultural myriad shaped by interests and experiences revolving around a fusion of languages and cultures...Made up of unique pieces created with an outstanding understanding and knowledge of tailoring, prints and pattern making, Iman Nakhala designs bring to life an unmatched weave of creativity, craftsmanship and curiosity. I loved the beautiful finish work and the blending of ethnic and modern aesthetics embodied in these designs. The use of embroidery detailing was kept subtle enough to keep the looks wearable in Vancouver. While I loved Samantha's beautiful dress in it's beautiful jewel tone, I personally would die to own one of this designer's jackets in black with red embroidery paired either with a matching pair of pants with the embroidery down the outside seam or with a pair of vivid red pants. This day in general held many interesting collections, but not many like Lu Liu's. This is the designer the photographer was interested in. It started with colour and moved right on through interesting prints and textures. Here is an excerpt from her VFW bio - "My collection is mainly about the mixture of Chinese and American culture. I have over fifteen years of extensive hand drawing and illustration extensive training with a famous Chinese artist. So when I build up my collection, I choose to print out my art work, which are water color and gouache; the photo of my city and my own photographs in my design with lots of modern elements. I used all colorful colors for this collection, it makes collection bright, fun, lovely, deluxe and gorgeous." We saw both male and female silhouettes including a jumpsuit, bubble dress and motorcycle jacket. There was a mix of pieces that were be very wearable along with statement making pieces that woudl require just the right event. Many garments were detailed with hand stitching. I think the details that popped for the audience the most were the appliqued lettering, the incredible use of yarn to create interesting shapes and the use of photography in several prints. Sara Armstrong was a breath of fresh air. Her collection hit the runway as a great counterpoint to the other we had been seeing. Everyone has heard the term less is more and that was so apparent here. This collection stood out in a different more subtle way and I instantly sat up in my seat. Here is an excerpt from her VFW bio - "Sara Armstrong is an interdisciplinary artist who practices in both industrial and fashion design. [She] creates ready to wear pieces with an androgynous blur, at once loyal to the functionality of heritage craftsmanship and subversive in their welcoming of innovative details. With a focus on architecturally inspired urban luxury, Sara’s formal training in sculpture is immediately apparent in pieces that balance complex geometries with pared-down simplicity. Lucid yet intuitive, Sara’s work is hinged upon a tactile, hand-worked approach to design and an uncompromising appreciation for authenticity and quality. I loved this collection and am going to have to find a way to include something from this designer in my wardrobe. It is understated elegance. The construction was beautiful, the lines interesting, the shapes quietly caught my eye - something that reflects great thought and skill. I think the statement above about architecturally inspired urban luxury probably best hits the nail on the head. Kudos to Armstrong for creating such a unique, strong collection. This designer is going to the top of my must watch list. 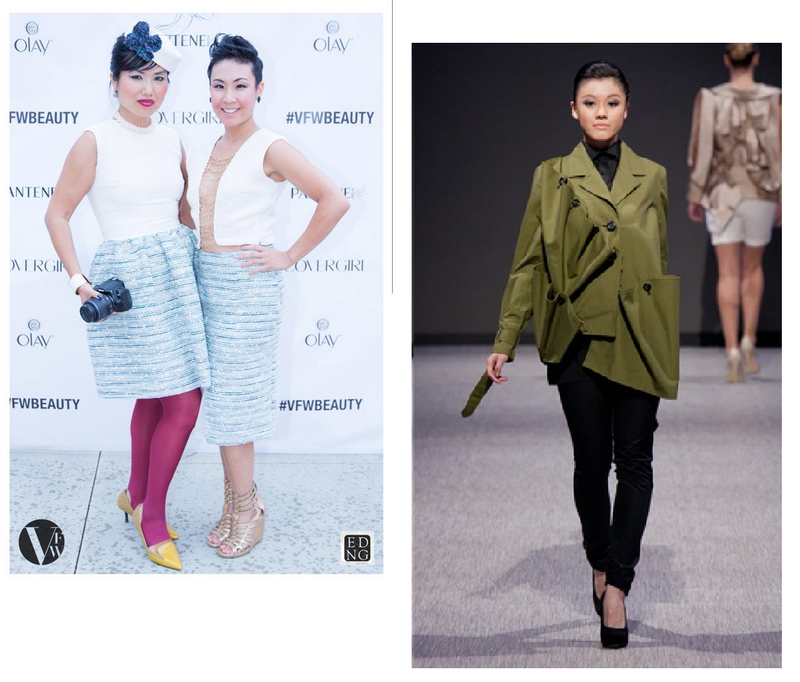 Alex S. Yu was selected from among a group of designers by Niche Magazine to be featured this season at VFW. Founder Tracey Drake shared before his show how important it was to support emerging designers and that their sponsorship was a $15,000 package that included a wide range of support to help this talented designer build his brand. As to why the magazine selected you - "We're very impressed by Alex's creativity and have found ourselves drawn to his design techniques and aesthetics. His creative process is dark yet he conveys his designs through beautiful garments in all geometry - unprecedented and delicious." Here is an excerpt from his VFW bio - "Alex S. Yu is a fashion designer raised in Vancouver, who studied fashion at Blanche Macdonald in Vancouver and the prestigious London College of Fashion in the UK...His S/S 2015 collection is inspired by his travels to London and Paris. For nearly two years, Alex was heavily influenced and inspired by the youth and graffiti in these two urban centres. Using a naïve approach, inspired by Dr. Seuss, Alex brings will present this youthful turmoil through rose coloured glasses." The collection is titled, The Lost Youth. I think everyone in the audience was intrigued. This was a conceptual collection of interesting silhouettes, bright pops of colours and and a mix of fabrics - structured and soft, shiny and matte. These garments showcased the designer's vision and originality, so it will be interesting to see as he heads into the retail market how these ideas translate into clothing that embraces the feel, but is more wearable on a daily basis. Congrats to Yu for all you have and are accomplishing and special thanks to Niche Magazine for stepping in each season to support an emerging designer.